(Nanowerk News) A green technology spin-out company from the University of Bath has secured funding of almost £750,000 from the Royal Society Enterprise Fund and local Business Angels including John Clough, former Chief Executive of Eaga Plc. The funding will enable nano-porous solutions Ltd (n-psl), established in July 2007, to commercialise new ground-breaking nano-porous adsorbent hollow fibre technology. Originally developed by scientists at the University of Bath, the applications for the nano-porous adsorbent hollow fibres are numerous and have already attracted a huge amount of interest from many sectors. 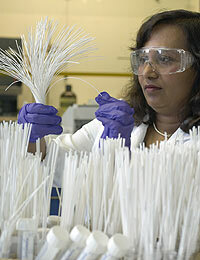 Dr Semali Perera helped develop the nano-porous fibre technology in the Department of Chemical Engineering at the University. Within compressed air treatment it has the potential to lower energy consumption by up to half that used by current technology. It is estimated that this could translate into minimum accumulated savings of over four million tonnes of CO2 by the year 2050 in the UK alone. Other key markets that may benefit from the new technology include aerospace, pharmaceutical, health care, environmental, life support, medical and food & beverage. The Gateshead-based company is located in a purpose-built facility on the Team Valley Trading Estate where commercial-scale manufacture of products will take place for the world-wide market. Colin Billiet, Chief Executive of n-psl said: “This investment will enable n-psl to progress to the next stage of commercial development. New products are to be introduced to the market using the novel adsorbent hollow fibre technology. “Research has been expanded to ensure the technology lead is extended, supporting commercial developments. The new investors provide a strategic fit and will strengthen the Board of Directors, supporting ambitious plans for future growth.